The I-5 freeway in Tacoma, Washington, has approximately 50,000 cars zipping to and fro every day. From cell phone calls to radios blasting to remembering to pick up the kids, drivers have a lot on their minds. It would be easy for them to fly right by the Tacoma Mall exit without ever noticing Renton Western Wear. Easy, that is, except for the giant cowboy boot on the rooftop. When Renton first contacted Landmark Creations about their inflatable rooftop balloon, they had one specific goal in mind: Cause cars on the I-5 freeway to stop and come into our store. Simple enough. So, we went to work creating a "landmark" that would represent Renton well while also grabbing attention from motorists. The result? 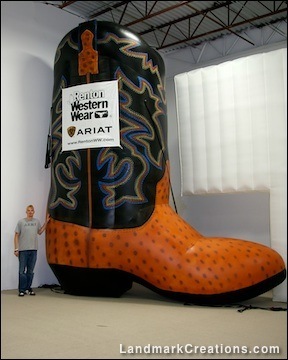 An inflatable rooftop balloon shaped like a cowboy boot that looks like the real thing. Has it worked? Jerry Kavsh with Renton Western Wear had this to say. "[Our inflatable] increased customer traffic which increased sales. We are able to directly track customer traffic caused by the boot, so we know the inflatable boot paid for itself within the first year." Now that's a smart investment! Renton chose Landmark and continues to work with us because of our local presence in Minnesota, our experience and our competitive pricing. Let us help you drive more traffic!